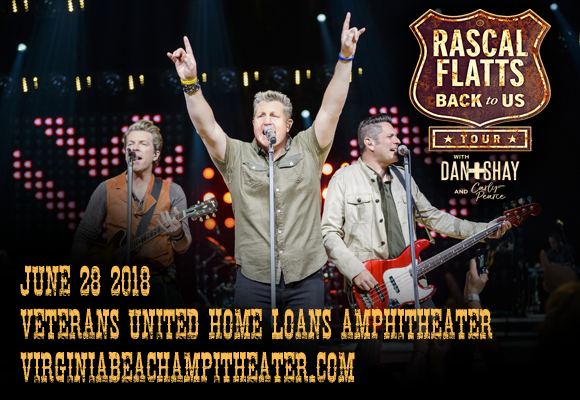 Rascal Flatts will be bringing their energetic country show to Veterans United Home Loans Amphitheater on Thursday 28th June 2018! A night of hits and harmonies, the Back to Us tour sees the band performing tracks from their latest album of the same name, and has the trio hooking up with Dan and Shay & Carly Pearce in support! With twelve top ten studio albums on the Billboard Top Country Albums chart (seven rated platinum or higher), twenty-five top twenty singles on the Billboard Hot Country Songs Chart, sixteen number one hits and over 23 million records and 10 million tickets sold, Rascal Flatts are one of country music's biggest bands. The vocal trio was formed in Columbus, Ohio in 1999, signing to Disney Music Group's Lyric Street Records in 2000 and releasing their self-titled debut album later that year. Their most recent studio album, Back to Us, was released in 2017.